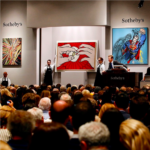 “The goal is to reposition Sotheby’s on the West Coast to be perceived as the strongest presence,” Fiuczynski said. Sotheby’s Fiuczynski said she analyzed the demographics of various locations in order to target different groups’ interests. The most expensive lot to be shown is Rothko’s 1951 canvas “No. 21 (Red, Brown, Black and Orange)” consigned by the Schlumberger oil family. The 8-foot-tall canvas could bring more than $50 million, Sotheby’s said. It was exhibited at the Museum of Modern Art in 1952 as part of influential “15 Americans” show. In 1972, the work was acquired by Pierre and Sao Schlumberger. Another highlight is a small 1983 “Flag” painting by Johns, estimated at $15 million to $20 million. Acquired directly from the artist the year it was made, the work has been on loan at the Philadelphia Museum of Art from 2007 to earlier this year. There will be lower-priced art. Mike Kelley’s work on paper, “The Past and The Future,” is estimated at $50,000 to $70,000 and Vija Celmins’s “Pink Pearl Eraser” is valued at $180,000 to $250,000.